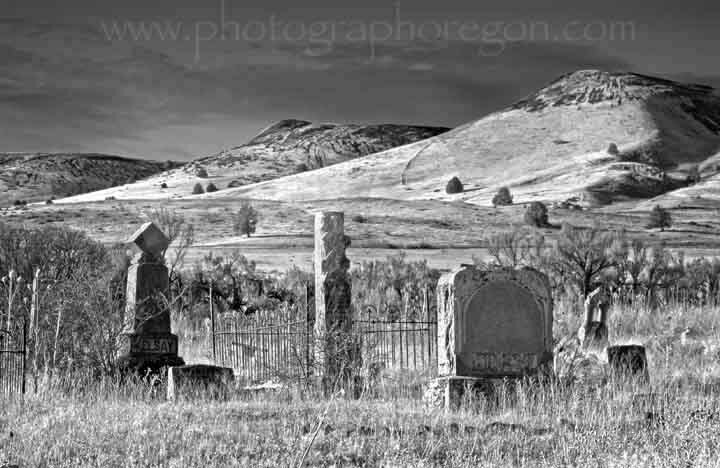 Much of the impact of HDR is the vibrant colors, black and white HDR is a different realm entirely. Now we’re going to play a little processing mix and match. Let’s mix the world of HDR with the world of black and white. While at first this mix might seem a little counter productive since on the surface much of the impact of HDR is the vibrant colors, in reality in my opinion (humble) it’s apples and oranges. The pop factor of HDR in the structure of the lines makes for some interesting black and white outcomes. Also, dramatic skies can really benefit from this application. The whole idea starting to make it’s own place in the art photography word. Black and white HDR, like color HDR, of course, can be taken to extremes. I’m more fond of the reality on caffeine approach rather than the reality on crack also known as “Lizard Vomit HDR” approach. This is one of those areas though where art is anything you can get away with. The field is new and swings wide so if someone’s paying you money for lizard vomit. Take it and keep on spewing. So what I'm saying in short is, occasionally I embrace the halo. The halo, that light that surrounds hard lines often found on structures and the edges of mountains and such when overly HDR’s, in many people’s opinion is to be avoided at all costs. For the most part I try…and then there’s the raven. 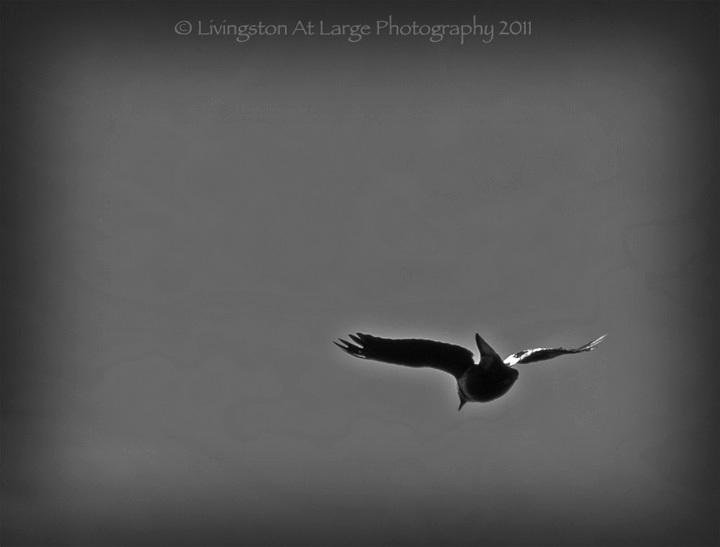 It looked so pretty all halo’ed during Wednesday birding, that my opinion is….embrace the halo when it strikes you. That and I was looking right into the sun with my camera so I might have brain damage. Or is that blindness? I can’t remember. Lighthouses, with great skies are a good black and white HDR subject. Lighthouses are a good color HDR subject, lighthouses are a good any photography subject. There, I got that out. 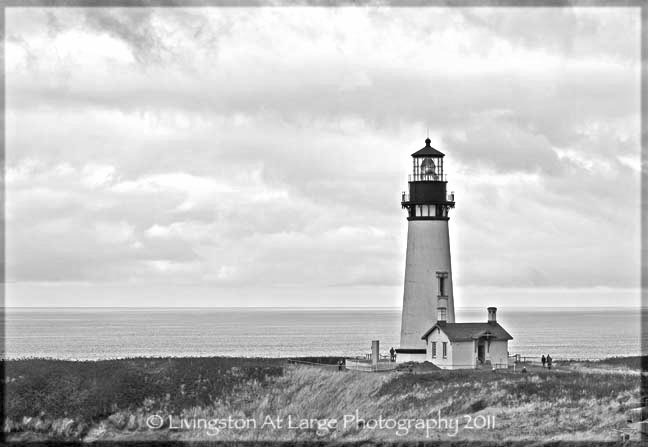 This is the Yaquina Head Light. Easy to find. Go to the ocean at Newport and turn left. (Or get the map from the Lighthouse page. Some animals look good in black and white. 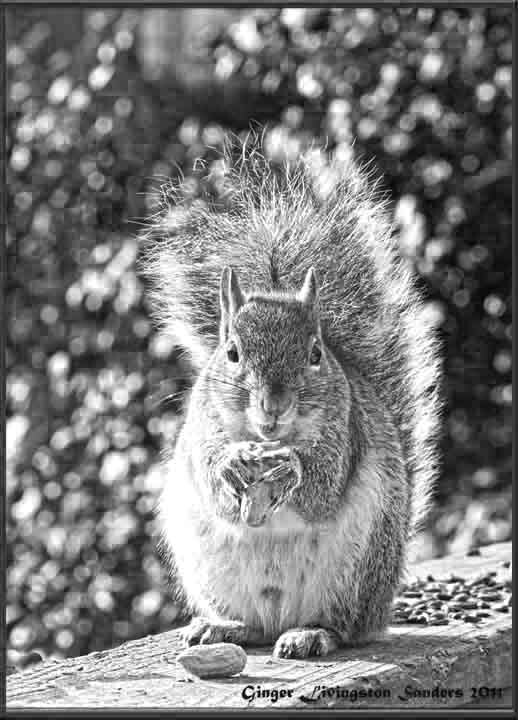 This is a gray squirrel so he’s already pretty devoid of color. The backlighting made him a good candidate for dual treatment. He got a boost of contrast from the black and white and his little fur more detailed from a light application of HDR. On a side note, the one bright spot he had was his PINK winkie poking out. Now, I know I could have cloned that over with fur but I didn’t quite feel right stealing his maleness. Poor guy, bad enough he was trying to air his stuff and grab a snack and some person came out and caught him on film (so to speak).